Getting a great sleep is essential to your dog’s health and happiness and we can help by offering this guide to the best dog beds for your dog. A useful dog bed does much more than offer a place to sleep. It brings comfort to your pet and offers your dog a place of its own in your home. The bed gives your dog a secure and private space of its own which can be customized to fit any size dog. Teaching your dog to use its own bed will save wear and tear on your furniture. Dog beds for large dogs require firmer construction to support the weight of a heavier dog while also offering comfort for the joint pain and arthritis that often come with age. You can also bring the dog bed with you when traveling to help your dog settle into new surroundings. Sleep science has produced wonderful beds for humans and now we use the same principles to bring you one of the best dog beds for your pet. Your dog will be more rested and comfortable on this high quality Big Barker dog bed that is handmade in the USA. 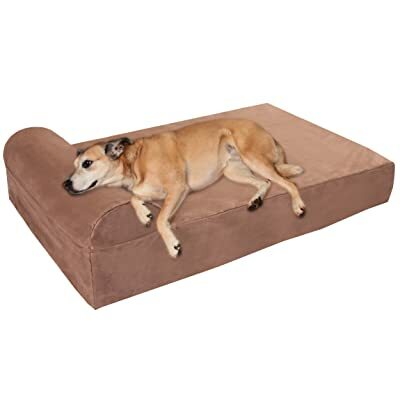 Quality materials make this one of the best memory foam dog beds that you will find anywhere. The size, construction and easy care instructions all make this a superior choice for your large to extra-large dogs. The foam is guaranteed to hold 90% of its shape and loft for 10 years or your money back. This company really stands behind its dog beds. The reason this dog bed comes with such a great guarantee is because of the hand-crafted construction and quality materials. Craftsmen in Northern California have been making these dog beds for over 30 years. The level of experience and consistent quality is a hallmark. This is the reason that loyal customers have been calling them the best dog beds for large dogs and referring Big Barker beds to their friends. The zippers and foam are all made in the USA to exacting standards. 7″ of superior quality foam are the reason that your larger dog will find this bed comfortable for any sleeping position. Just like a human bed, the Big Barker dog bed is stacked with layers of foam for comfort and durability. For added comfort, a bolster made from 4″ of contoured foam is added to one end of the dog bed for those dogs that like to rest their head on a pillow area. If your dog is bothered by arthritis or dysplasia, orthopedic dog beds like these Big Barker beds are great for supporting joints. Your dog will quickly find this to be one of the most comfortable beds around. The Microfiber cover is custom fit to each mattress. The cover is very soft and is easy to clean. To maintain the appearance please follow these easy care instructions. Simply unzip the cover and machine wash in cold water. Hang to dry or use the low setting on your machine. The foam can be hand washed with cloth, soap and water. The foam should not be put in the washer or dryer, hand wash only. The Big Barker dog bed will be one of the best purchases you will make for your large dog. The superior construction and great guarantee make it a perfect choice for your dog. This self-warming dog bed is one of the best dog beds available that will help keep your small dog warm. The warmth comes from your dog’s natural body heat not from electricity so there are no cords to worry about. If your dog likes to curl up when sleeping, this bed will be the perfect spot. The soft sides curl up around your pet to help keep it warm. The raised sides also provide a sense of security by making a cozy nest for your dog to sleep in. Inside the bed are materials specially chosen to retain body heat for your dog. A layer of insulation with metallic features helps radiate warmth back to your pet. The stuffing is filled with premium polyfil which is a recycled material made from plastic bottles. The stuffing holds warmth and is easy to clean in the washing machine. The outer covering on the bed is composed of two materials. The lining is a super-soft plush microfleece. A poly/cotton material covers the sides and comes in a contrasting color to complement the inside fleece. A non-slip material covers the bottom of the pet bed to help the bed stay in place in your home even when your dog is moving around a lot. 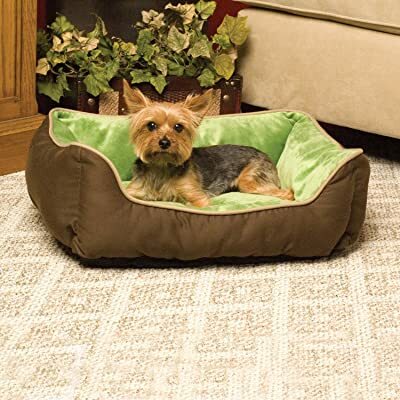 This dog bed is regularly featured in the best dog bed reviews because of its great features. This bed is both stylish and functional. The soft fabrics are color coordinated to look beautiful together and will be a pleasure to have in your home. The heat that this bed retains helps your dog stay warm in all conditions and is one of the reasons that this is among the best dog beds available. 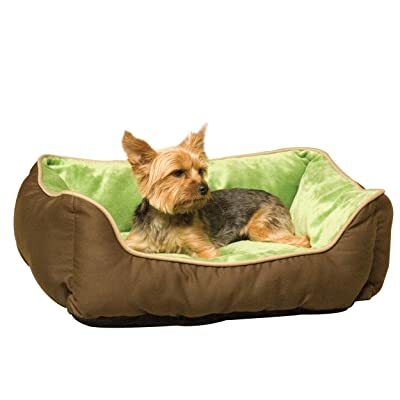 Your dog will sleep better when it is warm and comfortable in this great dog bed. Sometimes, drafts from windows or doors can affect your dog and stop it from enjoying a good sleep. Having a cozy dog bed to lie down in is a great way for your dog to feel calm and relaxed as it goes to sleep. The upholstered sides are slightly raised which is a great feature for dogs who like to put their heads on pillows while they look around the room. The sides are soft enough that they will lie flat if your dog kicks its legs out, but they stay upright and add extra warmth the rest of the time. Washing this bed is easy since you can simply put the entire bed into the washing machine on a cold water cycle. Tumble dry on a low setting or hang to dry. This bed will continue to look great even after repeated cleanings. The original dog bed came in one size model with two color combinations. Recently, the company has expanded the selection to include medium and large models with alternate color choices. This company is known for responding well to customer suggestions which is one of the reasons why they are known for the best dog beds. Customers and pets are extremely happy with these warm and comfortable dog beds. The quality construction helps them last for a long time. Families with more than one pet often comment about how happy they are to buy more than one dog bed so each additional pet can have a great place to sleep. This versatile pet bed is not only one of the best dog beds available, but it also comes in sizes to fit a cat, for people with more than one pet. With a choice of round or square shapes, these great pet beds will fit comfortably into any home. You can put them next to your favorite furniture or fit them in a nook anywhere. They also roll up small enough to travel with you so your pet has a comfortable place to sleep while you are on the road. The cover has great features that are not found on many beds. The top of the cover is made from soft velvety material that is easy to clean. The bottom is a waterproof liner to protect the pet bed from anything tracked in on the floor. The bottom also has anti-slip features to keep the bed firmly in the place you want it to stay. You don’t have to worry about your pet scooting the bed around your home since the skid-free material helps keep it in the right spot. 100% poly fill makes up the filling. The fillings come in several pillows that add extra thickness. Having three pillows for the interior makes it easy to remove the cover for cleaning. You can fluff up the pillows and the stuffing has gussets to resist clumping when your pet sleeps on the bed. Easy to Use for Small Pets: Simply put, these pet beds are some of the easiest beds for your pet to get on. Your small dog or cat will love how easy it is to get on and off these pet beds. There is no jumping required and the beds do not have awkward bolsters or rims for your pet to navigate over. When you look at dog bed reviews, you will notice that many beds come with extra features that your pet probably does not need. Why pay extra for these features if your dog will be perfectly happy without them? Amarkat pet beds are ideal for pets that just want a comfortable place to sleep and don’t need any extra features. If your dog has shorter legs it will appreciate not having to jump over thick sides or climbing onto platforms. 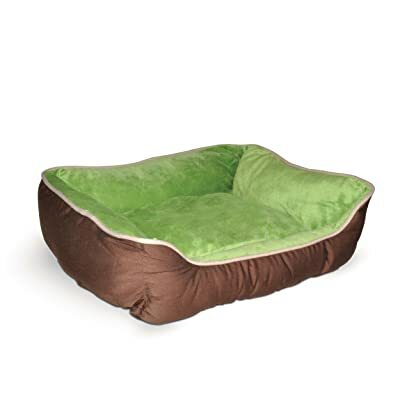 Likewise, older dogs or those with health issues will enjoy the ease and comfort of using this mattress style pet bed. After giving one of these beds to your pet, you will see why this is one of the best dog beds that you can buy. Affordable, stylish, and easy to care for are some of the comments from happy owners who have bought these great pet beds in the past. The Fantasy Furniture collection includes some of the best dog beds available that offer comfort for your dog while looking stylish in your home. What would look better in your home than a real piece of furniture built especially for your dog to use? The Fantasy Furniture Deluxe Bed looks like a real sofa and comes in seven stylish colors that will complement your other furniture. The best dog beds provide easy cleaning that comes from the Leatherette upholstery. The foam construction is high-density to provide a well defined shape that continues to look good as long as you own the dog bed. Some great features are included with the Fantasy Furniture Deluxe Bed. 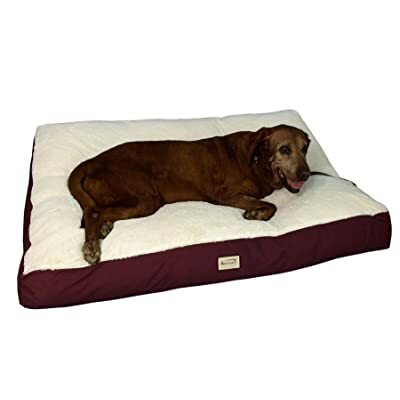 Memory foam dog beds like this one are great for helping any dog get a restful sleep. The comfortable padding will be enjoyed by dogs that are lucky enough to sleep on one of these deluxe dog beds. Orthopedic dog beds are particularly well suited to dogs that would benefit from extra support in the bone and joints. Older dogs and bony dogs do particularly well with these dog beds since the comfortable mattress helps comfort and protect pressure areas. This great looking bed is made with a wood frame for durability and long life. The removable cover is machine washable and will help keep the bed looking great for many years. A matching mat for the floor that comes in the shape of a dog bone. The mat is reversible with a solid color on one side and either a pattern or a different solid color on the other. A matching squeaky toy that is super fun for your dog. 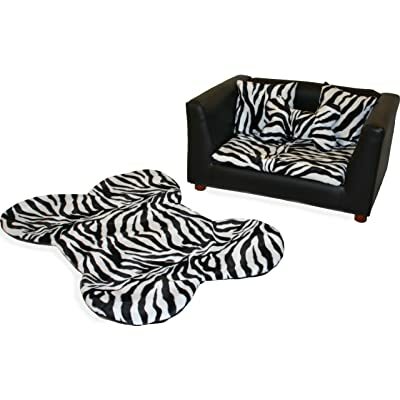 Matching pillows for your dog’s comfort that enhance the look of the dog bed. The actual bed sleeping area is slightly smaller than the total sofa size, but is well suited for most dogs. The bed sleeping area measures 27″ by 22″. The total bed size is 36″ wide x 24″deep x 20″ high, which fits easily into most homes. The free mat can be used anywhere to create a secondary spot for your dog or to keep your dog warm when on the floor. The mat also makes a wonderful travel bed that you can take with you when you are away from your home. If you want to use the mat that comes with the set its size is 38″ by 27.5″. While this dog bed is sturdy, it is easy to move it around when you want to relocate it to another spot in your home. This dog bed only weighs 20 lbs so it is easy to use. Another feature found in the best dog beds is that safety is a priority. This deluxe bed has flame retardant qualities built into the high quality foam material. The Fantasy Furniture Deluxe Bed is a great dog bed that will look wonderful in your home while providing comfort for your dog. Selecting a bed for your best buddy is not difficult but it helps to keep a few things in mind. We have put together this list of 7 things to think about when shopping for your dog’s new bed. Select a material that helps control the spread of fur, dander and dirt. Scratch or chew proof covers are recommended for puppies and chewing dogs. Removable covers are easy to clean. Covers that can be wiped off are useful for puppies, outdoor dogs or older dogs with incontinence. Some people keep two covers so that they always have a fresh one ready when it’s time to clean the other one. Insulation qualities offer warmth in the winter and cooling in the summer. The padding gently supports bones and joints to ease pressure points and improve your dog’s comfort. Most beds come with polyfill or foam which can be loose or sewn into baffles to add support to the bed. Memory foam dog beds gently support your dog as it moves around during sleep. A comfortable foam bed will help your dog go back to sleep if it wakes up for any reason. Natural materials such as cedar chips smell fresh, help get rid of odors and can help repel insects. Be cautious, however, because the cedar absorbs excess moisture and can sometimes lead to a bacterial problem. Tough, water-resistant beds help your outside dog cope with the elements while beds with special filling can discourage insects. Inside dogs like having a spot where they can see the action inside the house without being stepped on. Finding a dog bed that fits the space inside your home will make things easier for you as well as your dog. The best dog beds offer great value since they stand up to constant use without wearing out. The research that you put into finding the perfect dog bed will ensure that the bed matches your dog’s needs and soon becomes your dog’s favorite place. The best size depends on the weight and breed of your dog. The following table gives a few examples of dogs that would fit each size of dog bed. Here are some examples of how to use the sizing chart for your pet. The Labrador Retriever is the most popular dog breed in the United States and these dogs are known for their good nature, intelligence and gentleness. Dog beds for labs account for their size up to 50 lbs and are sturdy enough to support heavier dogs. The Jack Russell Terrier will appreciate sleeping on a small dog bed that lets it curl up and stay warm while sleeping. In addition to size, the way that your dog sleeps will help determine the shape of bed that is best suited for your dog. Rectangle is great for dogs that like to stretch out while sleeping. Older dogs tend to like this shape bed. Round or oval is perfect for dogs who like to curl up when they sleep. It takes up less floor space than other shapes. Standard flat mattress is a simple design that fits most places. Bolster is perfect for dogs that like to sleep with their heads on a pillow. The raised sides also give a nice sense of security for your dog. 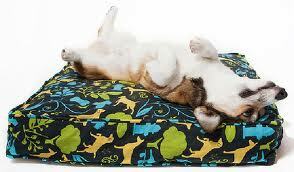 Orthopedic dog beds are great for dogs with hip dysplasia or arthritis who need more comfort on the joints and bones. Some dogs will chew anything that you give them but you can still choose a dog bed that will remain intact by carefully selecting construction and fabric. Metal frames provide great options for dogs that chew since their teeth can’t go through the raised frame. Puppies can be hard on dog beds and dog beds for pitbulls often are made using raised frames manufactured out of metal to withstand chewing. Each of your dogs should have its own bed to suit its unique characteristics and to have a place of its own to chew toys, observe the home or sleep. While there are many options to consider when purchasing a dog bed, ultimately the best dog beds are the ones that your pet will comfortably sleep on. Active dogs who have high energy during the day need to rest and recuperate during their sleeping times. Having a comfortable dog bed will help them recharge their energy levels for the next day’s activities. Your care and attention when choosing a dog bed will not only help your pet get a good sleep but will reward you with a well rested dog that is healthier and happier. To help with your decision, we will provide you with a useful guide to selecting your dog bed as well as fully researched reviews on the different options that you have available. The features and benefits of each item will be compared so that you can make an informed decision when finding a bed that is durable and comfortable for your dog. Giving your dog the security of its own bed will help it feel safe while in your home or when traveling with you.